I've only ever photographed myself on a couple of occasions. Nonetheless it's a good process to go through for a photographer as it allows us to explore our identity and how we can use photography to present ourselves to the world. This particular photo was made just outside the lift in a boutique hotel in Beijing, China. It's just a bit of fun in the early stages of familiarizing myself with my then new Leica M9 camera. Just look at what I did to my nose to ensure I had the best possible vision through the camera's rangefinder. The image was made at 1/15 second with an aperture of f/5.6 at ISO 800 with a Leica M9 camera and Leica 35 mm f/2 Summicron-M series lens. It was night time and I had returned to the hotel after a winter's evening exploring the surrounding neighborhood. My reflection and that of the Chinese characters that look a bit like the term OK were formed on the surface of a very shinny lift. As it was night the only lighting available to me came from a weird mix of artificial light sources. The reason for making the photo was to explore reflections and the notion of representation. How much of the person we present to the world is true to who we really are? Reflections are, by their very nature, a distortion of reality. We do not look like our image in the mirror, with its reversed viewpoint. Yet how much of our inner self is actually evident through our outward appearance? 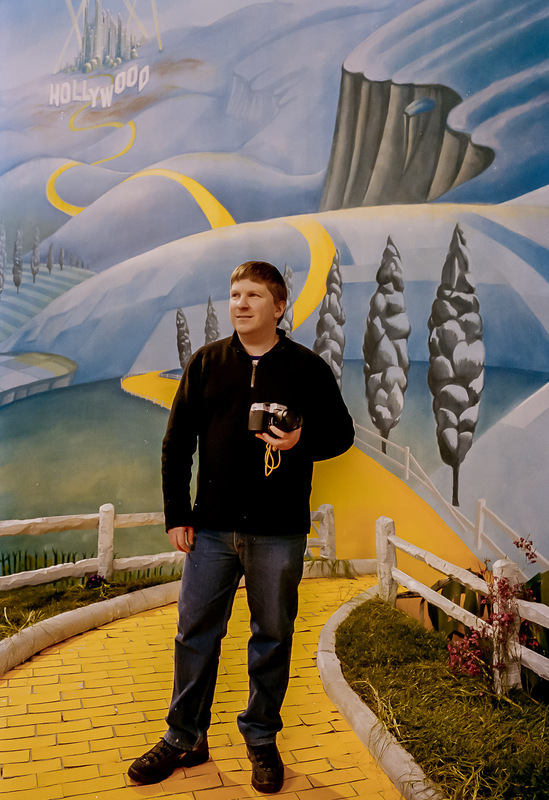 Glenn Guy, the Travel Photography Guru, working on the set of the Australian short film Yellow Brick Dreams. Photo by Matt Tonkin. Why Photograph Yourself Holding Your Camera? It's common for a photographer to portray themselves with a camera and expensive lens attached. However, if I was a potential customer, I'd assume you'd have really good camera equipment. It's a given! So why do it? Perhaps it's the unfortunate association photography has with equipment. Perhaps the equipment is used by the photographer as a kind of shield or mask by which to hide themselves, at least in part, from the world. Of course since the advent of social media, particularly Instagram, it’s become increasingly popular for people to photograph themselves. Actually, I think it's fine to make photos of yourself, whether or not your camera is included in the picture at the time. What matters most is that you have photos of yourself and that they're interesting images. Glenn Guy, the Travel Photography Guru, with a local retailer and Col Pearson, a participant in a photography tour Glenn co-ran at a market in Buenos Aires, Argentina. Photographer Unknown. If I Look Into The Mirror What Will I See? The photo of me reflected in a mirror in the streets of Nordragota, a small village in the Faroe Islands is, I hope, visually investing. I'm holding the camera, not so much because it forms part of my identity, but simply because I was travelling on my own so I had to to be able to make the photo. But the camera fills up less than one percent of the frame so, clearly, its presence is only incidental to the image in question. While the photo might be a little goofy, I knew I didn’t want it to look that way because it was yet another photo of a photographer holding onto their camera. There’s a great photo of photographer Martin Bailey on the About page of his website. Martin's an excellent wildlife photographer and a great guy. Like me Martin is also a Master at The Arcanum. The photo of Martin that I'm referring to is an extremely well made studio photograph featuring Martin with some really nice Canon gear. Now, to my mind, this image is a bit of an exception. It's very well crafted, which I can appreciate, and the lens in question is a thing of beauty. These comments only illustrate that judgement is a very subjective concept. The inclusion in the photo of a rather specialized telephoto lens identifies Martin as a serious wildlife photographer and, as such, is appropriate and specific compared to the more generic here's Wally with his camera photo common to most photography websites. Glenn Guy, the owner and primary content producer of the Travel Photography Guru website and blog on an early expedition to Pangong Tso (i.e., Pangong Lake) in Ladakh in northern India. The above photo of me at Pangong Tso (i.e., Pangong Lake) in Ladakh in northern India was made in, I think, 1992. It shows me, very much, on location yet without any camera equipment. Do I need to be holding a camera to tell the world I run an educational photography website and blog called the Travel Photography Guru? As you can see a caption serves that purpose very well indeed. A self portrait of Glenn Guy, the Travel Photography Guru, outside Hallgrimskirkja Luthern church in Reykjavík, Iceland. Of course there's no rule, or it there was no one told me, that says Thou Shalt Never Photograph Thyself Holding Thy Camera. It's a free world, relatively speaking, and you can do what ever you like as long as it doesn't hurt anyone. What's more, just as it's fine to photograph a carpenter holding or swinging a hammer, it's fine to show a photographer, on location, doing what they do. A self portrait of Glenn Guy, the Travel Photography Guru, on the Mt Aspiring Road near Wanaka, New Zealand. The above image of me photographing a landscape from within the car is a bit cheeky. It's considered lazy making photos that way, and it's certainly not part of my normal practice to do so. What's more it's really not a self portrait as the camera has obscured most of my face. What it is intended to be is a fun example of how to be creative. The photo includes me, my camera, the car in which I'm exploring the south island of New Zealand and the wonderful landscape near the town of Wanaka. The photo also explores the notion of a travel photographer and the compositional concept of a frame within a frame. You'll notice how I'm framed in the window of the car which is, in turn, framed by the car's side rear view mirror and by the outside edges of the photo. It’s just another example of how important composition is in the making of my own photos. As far as your own internet identity (e.g., website, blog, Facebook, etc) is concerned it might be worthwhile examining how you choose to portray yourself? Photography, like any other passion, can bring its fair share of hardship and joy, frustration and elation. Your photographs, as much as the words you choose to you, can describe your experience in a very authentic and powerful way. What's your connection with photography? What is there about photography that you find attractive or compelling? How does the practice of making photos fire your imagination and creativity? If it's a love of the natural world that drives you to want to be a better photographer, perhaps a photo of you in a beautiful outdoor location would be a better option than a friend’s mobile phone photo showing you downing a beer. It's okay to include your camera in the photo, but try not to make it a dominant or competing element within the frame. The photo is, above or else, supposed to be about you, not your equipment. If you work as a professional photographer then what is the reason you have entered into your business? If the answer is to provide your family with a better life then, perhaps, you could include a photo of you having fun with your family. This photo, when viewed regularly, should also re-enforce in your own mind why photography is such a large part of your life. Because it serves the needs of the one’s you love. Do you really want to be identified with your equipment or with the reasons why it is that your do what you do?